"Of the documents in the ITS Archives, 85 percent have been digitized and can be seen and used for research at computer stations in our reading rooms." 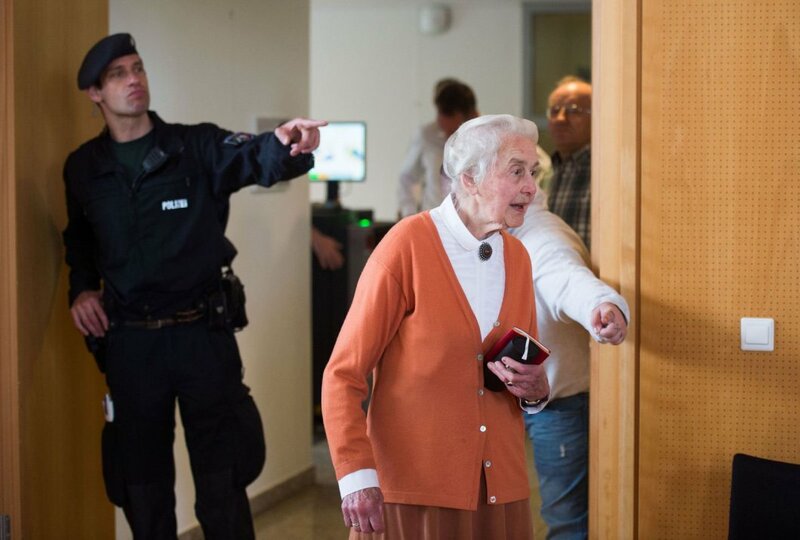 If you publicly question the holohoax on the way to the ITS reading room you will be arrested and thrown in jail for up to 5 years. By the same logic, the USA doesn't exist because you could once get arrested for burning the US flag. Your arguments amount to "look, squirrel!" None of them actually addresses the evidence presented. None of them have anything to do with it, actually. It's smoke and mirrors. Evidence that his testimony was coerced? What are you talking about? Hoss was executed after his own trial. Are you not aware that criminals are often called to testify in order to catch other criminals? And you dismiss this because? You have not given a single reason why his testimony should be dismissed. You simply said that he made his testimony, that he was poorly treated, and then... what? Yep all he is doing is trolling. He certain has not been trying to conduct a reasonable debate....unless he wants to be a chew toy for the fine folks here. I suggest a rather large hat, that should cover them adequately. Seriously , once you, after reading Hoess's own account of his torture, asked for proof that his testimony was coerced, I concluded that you are beyond rational discussion. There used to be more, but...his heroes took care of that. Oh you mean the guy who very freely and candidly talked about his treatment in his memoirs? The guy whose testimony is largely supported by other testimony, documents and physical evidence? "(i) Two days prior to the enactment of the German constitution on 23 May 1949, a Secret Treaty (Geheimer Staatsvertrag) was signed, which gave complete Allied control over electronic and print media, film, culture and education until the year 2099. As a result thereof, there are still 100,000 occupation troops in Germany; after 66 years there still has been no peace treaty concluded between Germany and the Victorious Allied Powers; and all of Germany’s gold reserves are held in the U.S. Federal Reserve Bank of New York, in which the Rothschilds have a 57% shareholding." Nice (completely unsupported) Nazi source. Last edited by Dash80; 22nd September 2017 at 09:20 AM. In other words, your interpretations are the only ones you'll accept as worthy of consideration. Either that, or you know you can't possibly support your claims, and are finding excuses to avoid doing so. I think you're characterising yourself. Do you remember the Tawana Brawley case? I do. I lived less than sixty miles from all of the places involved in the case. Brawley's story began disintegrating the moment it started. Doctors in the emergency room quickly determined that she was faking being passed out. Police officers received a bizarre interview. Eventually, Mike Taibbi would do award-winning journalism in unraveling the case. In Wappinger's Falls and Newburgh, he invented a fictional three-fingered man and found many teens who swore such a person had been seen. The FBI would run DNA tests to determine not just that she was covered in dog feces (and not her own as she claimed), but the exact dog it came from. There was never a time, right from the beginning, that Brawley's story was accepted as fact. And by the time her abductors would have come to trial, she was being sued and her lawyers were losing their licences. That hasn't happened with regard to the Holocaust. It will be the end of Judaism as a viable religion. You realize that you are playing an important part in helping reinforce knowledge of the Holocaust, right? Most people know generally what happened but they don't like to think about it very much. You cause them to look at sources, read documents and otherwise confront the information. They come out more knowledgeable and they are more likely to spread that knowledge. In any case, Jewish identity runs much deeper than the Holocaust and it won't subside any time soon. If you don't believe me, visit any synagogue at any time, watch our rituals and talk to our adherents. We aren't going anywhere, at least not as long as I'm alive. Saggy visiting a synagogue?! Nah, he prefers to hide behind his keyboard spewing his hate and prejudice. .....and all of Germany’s gold reserves are held in the U.S. Federal Reserve Bank of New York, in which the Rothschilds have a 57% shareholding. "The country's central bank announced Wednesday it has completed a program to repatriate gold bars worth nearly $31 billion from storage locations in New York and Paris. Germany has been bringing gold home to Frankfurt from the two cities since 2013. The final 100 tons were moved from Paris earlier this year, the central bank said. In total, 743 tons have been transferred. The project was completed three years ahead of schedule. But it's also a recognition that times have changed: Germans are no longer worried about preventing their gold reserves from falling under Soviet control -- a real fear during the Cold War. And the central bank no longer needs to keep gold in Paris as a protective measure that would allow it to quickly exchange international currency in an emergency. Both countries use the euro." "Much of the gold in the vault arrived during and after World War II as many countries wanted to store their gold reserves in a safe location." A denier twisted something as mundane and ordinary as that in to some kind of Jewish conspiracy? I think I'm done here, Saggy. I'll keep paying attention, your comments are comedy gold and help me with my list but replying to you is a waste of time. The others are doing a fine enough job torching you, they don't need my help. Yeah there's no discussion going on here, just endless effort to try getting Saggy to debate in good faith. Everyone is trying, but Saggy is really "trying." But we do get treated to Saggy's mindless repetition. When he pulled out the goofy Bad Arolsen chestnut, a comedic moment at Rodoh over a year ago, I felt like saying enough, too. There is limited interest in the umpteenth debunking of Saggy's mangling of history and ancient, oft-repeated lies. Bad decision on his part to be a total bore. Last edited by LemmyCaution; 22nd September 2017 at 12:15 PM. There is no Holocaust denier who debates in good faith. They can't, or else they would have to tackle the issue of where all the alleged survivors ended up and for the Holocaust to be a hoax means millions of willing participants, all governments and the entire academic study of history. I've actually debated with at least one denier who discussed the Holocaust in good faith. Guess what? That individual is no longer a Holocaust denier. they would have to tackle the issue of where all the alleged survivors ended up and for the Holocaust to be a hoax means millions of willing participants, all governments and the entire academic study of history. And the willing cooperation of a raft of men who allowed themselves to be convicted and hung. Most Germans are ashamed of the crimes committed by their citizens (and rightly so). This is one of the reasons why Holocaust Denial is an offence in German legal statutes. Haverbeck knew the law, but took the risk anyway, and was punished for it... and good show too. I would have given this Nazi sympathiser the maximum five years. Could we have a link to a real source for that? ecause of its central location in Europe, Germany has a number of NATO headquarters units based near German cities. However, almost none of these headquarters have combat troops attached. NATO countries have been cutting costs regularly every since the end of the Cold War and most find it cheaper to base their units on their own soil. As an example, the largest American unit in German is a United States Air Force wing at Ramsden that consists entirely of transport aircraft. The largest American ground unit in Germany is a special forces battalion that works along with other European special forces on missions in the Middle East and Africa. The old German/Netherlands division in Northwest Germany now consists of a joint NATO headquarters unit. The NATO air forces command at Ramsden has staff from most NATO countries rotating in and out, and is guarded by German forces and an American military police battalion. I don’t have the best sources at hand, but there may be as many as twenty thousand foreign military personnel in Germany on a given day, but almost all the old units some remember from the Cold War have gone home. Last edited by Hans; 22nd September 2017 at 03:40 PM. This thread has become so boring that I am reduced to correcting people's spelling. This should have read 'that piqued my interest'. He is a prince of unintended comedy - on a somber subject - but I disagree he is no longer trying at all and is just trolling. Yes and many European nations kept it there just in case WWIII broke out and Soviet tanks over ran mainland Europe. difficult or annoying; hard to endure. 2. What does a Hasbarian Cattle look like? Is that like Wagyu beef? How do you know? Maybe his interest was hiding behind the drapes. More lies from the Jew-lover. ...helped greatly by your not debating in good faith - repeatedly. So can we take that as you concession that all your previous points were wrong? Last edited by Hans; 22nd September 2017 at 04:39 PM. Why are you demand information you have already stated is lies? I've stated that Zisblatt, Wiesel, Meuller, Wiernik, S. Venezia, Gabbai, Bomba, Rosenberg, and others are prima facie degenerate liars the likes of which the world has never seen, and demonstrated it with example. However, I cited Dina Babbitt, who painted pictures for the children at Auschwitz, as giving honest testimony. There is extensive physical evidence for Babbitt's testimony, including pictures she painted that are still in existence. So, I'm willing to evaluate any testimony on its merits. HANNA-BARBERA! Open yer eyes! The Flintstones are behind the holocaust!!1!!1! Morgen's career demolishes the holohoax. And his testimony is a slightly weird bag, but deniers love it. Morgen was tortured and threatened at Nuremberg to implicate Isla(?) Koch, but refused. YES, EXACTLY! And then he turned around and described the AR Holocaust as he witnessed it (he caught the aftermath of Erntfest - tell me what Erntfest was will you?). You have just underlined the death warrant of your cause. Then his testimony veered off for a bit, and he testified that the Jews were responsible for the hoax as they were the ones who implemented it, and that there were gas chambers at Monowitz. Something which he corrected. Recall that he visited Auschwitz only a few times. The only explanation for these absurdities is that Morgen had to give something in exchange for his life, but insisted on protecting the SS. No. if that was the case he would have implicated Koch. He simply told the truth when it was true (except with Buchenwald - not a nice place). I stopped reading after that. Hoess clearly attributed oversight of the genocide to Himmler in his book. Have you read it Saggy? Because I have. Perhaps you'd like to summarize and discuss the testimony of just one Jewish eyewitness, along with any corroborating testimony, and any physical or documentary evidence that supports the testimony. RICHARD GLAZAR YOU ABSOLUTE AMOEBA! LOOK AT THE TESTIMONY OF FRANZ STANGL WHILE YOU'RE AT IT !!! Last edited by LeoMajor; 22nd September 2017 at 08:52 PM. Haverbeck, a Nazi propagandist, was sent to jail by the German Government, not "The Jews". What on earth are you talking about here?